The Balsamic Vinegar Glaze is produced by Acetomodena thanks to a knowledgeable mix of cooked grape must and Balsamic Vinegar from Modena I.G.P. 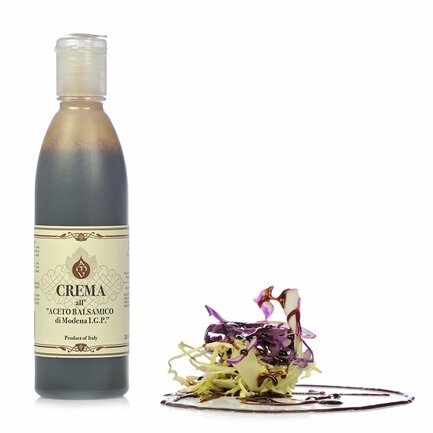 The result is a unique and tasty consistency mixing the sweetness of the grape must with the refined Balsamic Vinegar. Emilio region's gastronomic excellence at its best. 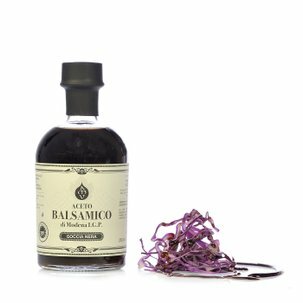 The Balsamic Vinegar Glaze is best with white meats, with a traditional Parmigiano dish and is extremely useful in creating attractive decorations on every dish. Ingredients Cooked grape musts, Balsamic Vinegar of Modena IGP 38% (wine vinegar and cooked grape musts), modified starch. ALLERGENS: contains sulphites For more information on product labels, please contact our Customer Service department. The information on the labels of the products may vary for reasons beyond our control, therefore, there may be discrepancies between the information on the site and that on the products delivered. Please always check the information on the product before consumption or use.